It's harder to get a link together for photos than it is to restore a K100. Well, back in Sept I bought a nonrunning '86 K100RS with Luftmeister turbo. It was in an accident and had been running previously. It had sat for > 5yrs. The previous owner wanted to restore, but death ensued. It ended up with me, anxious to restore original luster. Good news...it only had 10K miles. First... confirmed that it could run. Now that I got the thread going, I will update.. Excellent. It will be intersting to see how that turbo works when back on the road. Photo hint, do a preview before you submit your post. Give it a few seconds (15 - 30) for the photos to load in the preview. I am looking forward to reading about your progress and seeing your photos, progress so far is really good. Nice pictures. Thanks for posting these. I particulary like the one of your Trusty Helper. ~20 new pictures have been added to the photobucket album. Glass bead treated all aluminum. Had aluminum parts then professionally tumbled in ceramic and then walnut media. Cleaned, sanded and repaired to the best of my ability all fairing pieces. Painting to be done professionally. Wheels glass bead treated, one wheel repaired. They, as well as the fork legs, to be professionally painted. A Healthy & Happy New Year to you and your families. Cam and valve covers with new gaskets and rubbers torqued back into place. L rear peg mount and r rear/brake assembly remounted. More cleaning and buffing stuffs. done for awhile until wheels, fork legs being painted and gas tank & fairings are returned from painter (mid-late feb). I've just been browsing the photo's Peter, well done - looks super so far! Clear coat went on painted parts today. Take a look: last 11 pictures added today. Inspiring stuff mate, can't wait to hear this thing on the road. Candy apple, my fav! Can I have a side of amaz fries? Much has been done since last post and pictures. Still much fine tuning to do to really get bike running, braking as a reliable K bike should. The manuals, fiches sure are helpful, BUT none of this would not be accomplished without the help of 2 friends for guidance and support. Keep up the good work. Looks beautiful. Some say the last 5% of a restoration is the hardest part. Particularly weird problems in the electrical. Today the turbo project was completed and a 10 mile maiden voyage completed. I owe alot to the team of talented friends and professional mechanical help that was INSTRUMENTAL in completeion of this winter project. As you can see, much was done. It is what you can't see that makes this '86 K100RS FLY. & more... purged of electrical gremlins. What I can tell you is this: It runs GREAT, the turbo comes on at 5K rpm building to 8psi of boost and is smooth to warp speed. On my initial ride there were no issues and it seems the the time & $ spent having the bike professionally gone over was worth it! I will look forward to putting more miles on the machine to assure it's worthiness for the long haul. I will get some on road video in short order and get it linked here..
saw this for sale at mx bmw in hampton nh....do you think this could be the bike you rebuilt? 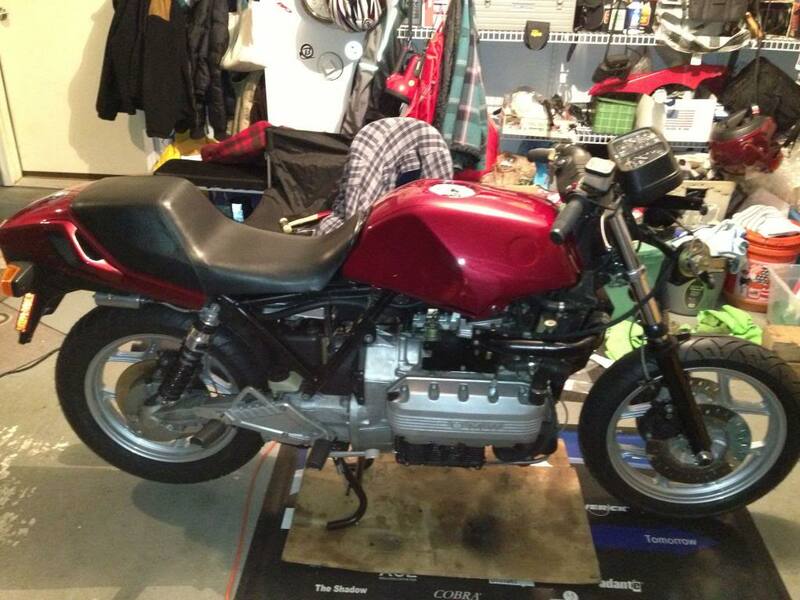 @AT Rick wrote: saw this for sale at mx bmw in hampton nh....do you think this could be the bike you rebuilt? Rebuild what? Looks to be in excellent shape. Looking at the pictures the mileage seems believable to me. And Max is a reputable dealer. I doubt they'd fudge on miles. Luftmeister turbo'd about 100 K100s. They only did a few K75s though. I have a Luftmeister 86 K75 Turbo but it has a few miles on it. About 125K. @duck wrote: Looking at the pictures the mileage seems believable to me. And Max is a reputable dealer. I doubt they'd fudge on miles. i don't think for a second that max's would fudge mileage...too much rep at stake....no, if it happened at all it woulda been prior to their having anything to do with it. does anyone have any idea what something like that would go for? they don't even have a price listed.....i know i had a 92 with panniers in fantastic shape and fewer than 10k miles on it that i bought and sold for around 4-5k....but i have no idea what that turbo would add to the price....anyone have any guesses / experience? If Max had any doubt about the mileage they'd say so. Somebody probably bought this a collector item and never rode it. Or it was lost in a warehouse for a long time. It's worth what somebody would pay for it. You really can't Blue Book a vehicle that unique. It almost almost looks like an 8 there at the beginning, but, when comparing it to the other 8! Prolly just an optical illusion due to reflection...to the moon and back. This guy is still holding on for the filthy lucre, tho' he's dropped from the 8 Large he was asking a year ago. Repropf wrote: The previous owner wanted to restore, but death ensued. It ended up with me, anxious to restore original luster. Good news...it only had 10K miles. & more... purged of electrical gremlins. . . . In the opening post, Reopropf indicated the moto had approximately 10K miles on the clock. In Reply #21, Reopropf indicated that the instrument cluster had been removed and replaced. 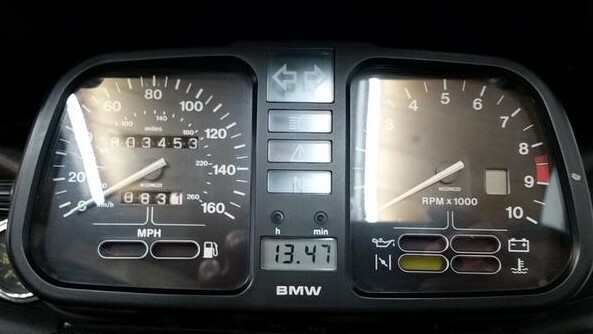 The replacement odometer must have clocked the 3453 miles stated by MAX's ad, so nobody really knows what the mileage is on this moto—MAX BMW included. It doesn't matter either. The eventual buyer will have been intoxicated by the moto's sparkle and its potential. @Laitch wrote: It doesn't matter either. The eventual buyer will have been intoxicated by the moto's sparkle and its potential. So worst case it's got 15K on it? Not even broken in. My K75 turbo had 118K on it when I found it. Needed lots of work on the usual stuff but when I opened up the turbo to inspect all was good. Front and rear rotors replaced, final drive replaced, turbo rebuilt. Rebuilt retrofit rear shock. Sounds like it's been around the block at least a couple times. This machine is NOT the one I restored. It was a fun project, but once completed, was time to move on. My friend Don R got it, and he too moved it to another fine gent. These machines NEED to be used, or they ROT. Easily remedied with TLC, time & $$. @Two Wheels Better wrote: This guy is still holding on for the filthy lucre, tho' he's dropped from the 8 Large he was asking a year ago. By the time he sells it we'll all be riding electric bikes. It has an innovative comfort heating system. "Adjustable temperature switch wired into the radiator fan motor harness, reduces engine temperature for rider comfort for various riding seasons." @Reopropf wrote: This machine is NOT the one I restored. Thanks for filling in that detail, Peter. It's appreciated and now we know there are others out there in such good nick as yours. I hope the newest owner is enjoying the machine.